Let's deal with that mind-break first. From 2,400 metres the volcanic landscape of Tenerife is closer to that which you would experience on the moon than a tourist-friendly holiday destination. Jagged, blasted rocks litter a barren wasteland that is filled with, what at first appearing like sand, is close up actually incredibly fine silicate micro-stone dust. Despite the sun, which at the coast has heated the environment to a warm 23 degrees Celsius, up here among the brownish-red rock of the volcano's upper echelons, the temperature is a considerably cooler six, and the wind howls across the alien landscape. And T3 has just begun its descent in the New Nissan Leaf, the vehicle that has ghosted us up the volcano in a sharp 75 minutes - a journey that has involved the use of Nissan's ProPilot autonomous driver assist system and a fair chunk of its 40 kWh battery. In fact, looking at the predicted range, we actually don't have enough juice to make it back to our original destination. The thing is though, by the time we get back down to coast-level, the new Nissan Leaf actually has more battery power than when we began the descent. Welcome to marvellous technology of Nissan's e-Pedal with regenerative braking. For how it works, and our opinion on the new Nissan Leaf, read on. This is a real piece of magic from Nissan. By selecting e-Pedal from the car's centre console the vehicle's accelerator pedal becomes both the accelerator and the brake all in one. Sounds crazy right? Thing is, it actually works amazingly well. Sure, for the first five minutes of use it feels incredibly odd, as you are so used to a two or three pedal system, however, after that the fact that you press the pedal to accelerate and depress it to brake means you attain a smoother and less complex driving experience. And, what's more, the e-Pedal is equipped with a state-of-the-art regenerative braking system, so every time you raise the pedal to brake you supply some power to the new Nissan Leaf's battery. Indeed, it was by using the e-Pedal in partnership with the car's Eco mode (more on that later) that T3 managed to arrive at the bottom of the volcano with considerably more battery life (41 per cent) than when we began our descent (24 per cent). A game changer. Thing is, and this is a marked improvement over the last generation Leaf, you've now got some half decent power to play with when you simply want a more traditional two-pedal driving experience. The new Nissan Leaf's upgraded e-powertrain now delivers 150 bhp (110kW of power) and 320Nm or torque which, in partnership with its instantaneous, delay-free acceleration from standing, means if you want to put your foot down then you really can. Sure, you're going to affect battery range by gunning it everywhere, but its nice to know that if you get stuck behind slow-moving other vehicles, as we did near the foot of the volcano, you can quickly power by them. And, speaking of range, the new Nissan Leaf now comes with a NEDC range of 235 miles (378 km), and a WLTP range of 258 miles (415 km) for single-charge city driving, which in T3's mind at least, is definitely a mental barrier broken in terms of energy anxiety. When you consider that the average daily commute for 90 per cent of people in Europe is under 50 miles, and for many a fraction of that, the fact that the car offers such a range shows how feasible an electric car like the Leaf is. Sharp is the best way to describe the new Nissan Leaf's exterior aesthetic. Sharp angles are everywhere, from the V-shaped front, through the floating light clusters, and onto the cut-ridged rear detailing, there's no mistaking this is a car designed from a Japanese maker. There's very little compromise, really, especially when you compare it to the recently overhauled new Nissan Micra. Instead it looks like a car from the near-future, which in many ways it is. 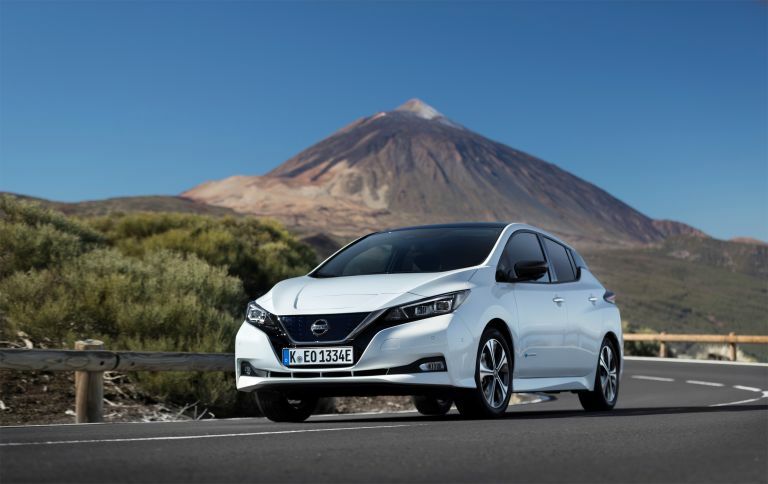 Not only is the electric whine delivered by the new Nissan Leaf remarkably cushioned and low key - Nissan has introduced new layers of insulation throughout the chassis - but the overall noise in the cabin has been carefully balanced. This means that as well as a eerily quiet drive in terms of e-powertrain, you also don't get overwhelmed in terms of road feedback or wind noise. This became particularly noticeable near the volcano's peak, where the wind rose to a high level. Eco mode, activated by a switch located to the left of the new Nissan Leaf's steering wheel, has been designed to work side-by-side with the e-pedal and reduces e-powertrain performance to conserve energy and enhance range. Yes, this means reduced acceleration, however it was a large part of how T3 managed to increase battery power in our Leaf from 24 per cent charge up to 41 per cent when coming back down the volcano. Inside the new Leaf you have what is almost an imperious driving position, which is quite high and cloistered, surrounded by a typically Japanese boxyness in aesthetic. This adds to the smoothly separated affect the car delivers in environments, with a world-within-a-world vibe generated. Ergonomically everything is well positioned, both on the dash and on the wheel, and the premium leather seats come as standard. We first reported on Nissan's autonomous driver assist system back in 2016, where we experienced it in a pre-production Serena on Nissan's Yokohama testing track. As such, it was great to finally get to use the finished system, which has since been upgraded, in a European production car. And it was incredibly easy to use, too, as we cruised towards the volcano's steep mountainous roads. Press the ProPilot button on the highway, wait for the on-dash steering wheel to turn green, and then sit back (hands still on the wheel of course) and get zen as the car follows the car in front at a set distance, as well as auto-steering to stay within its single lane. When we reported on the new Nissan Micra in January last year we were really enthused by its compatibility with Apple CarPlay. The new Nissan Micra has gone one step further though and now comes with both Apple CarPlay and Android Auto. This is a massive boon for the new Leaf and makes hooking up your phone to the car and then enjoying your music incredibly easy. If you pick up a new Nissan Leaf then you're going to amaze or win money off a lot of your mates with this. ProPilot Park uses the Leaf's in-built cameras and radar sensors to automatically park the vehicle for you. And, yes, that includes parallel parking on top of front and rear bay. Using it is incredibly straight forward, too. Simply press the ProPilot Park button, select the space you want to park in from the dashboard, and then when the system confirms it has detected the space, hold your finger down on the button. The result, hands and feet free parking. The new Nissan Leaf has a low centre of gravity, mainly thanks to its large battery which runs from mid-rear axle forward to under the front seats, and as such it feels very sturdy behind the wheel, building on its capacity as an excellent cruiser. The wheel is responsive and needs little input for cornering, something we get familiar with winding up and down the volcano, and in partnership with the e-pedal, provides a very smooth driving experience. Nissan has over 4,700 charging points across Europe right now and, by the end of 2018, aims to have more than 5,500. Charge time with a 50kw fast charger takes the new Nissan Leaf's battery from 10 per cent up to 80 per cent over a 40 minute period, with a full charge coming in at around the 60 minute mark. In addition, the new Nissan Leaf comes bundled with 10A domestic supply and 7kW charging cables for use from a standard power plug and, more optimally, Nissan's free-in-the-UK home charging station. Want to turn the new Nissan Leaf on remotely, activate its heated seats, or simply check on its battery's current charge? Well, you could always go outside and do it in the car, or you could use the NissanConnect app and stay inside out of the wind or cold. A small thing, sure, however it is something that appears incredibly useful in terms of daily domestic usage - especially on top of a wind-blasted volcano or in Britain's rain-prone climate. And, maybe most crucial of all, the new Nissan Leaf is available from a nudge under £22,000. This not only comfortably beats off the Tesla Model 3, but positions the Leaf firmly as an affordable proposition in terms of widespread adoption. For more information about the new Nissan Leaf's variants then head on over to its official website.